“Do Not Re-Upload! If we found [sic] out that the — clip is re-uploaded, we won’t share a — clip again!” – Seen on YouTube (video uploaded on December 18, 2011). “Credits and shot by b——y. For foreign fans: Please DO NOT modify the film and DO NOT take out without permission. – Please take out with full credits and don’t add yours [sic] credit in photo. – Do not modify the film & don’t cut the logo.” – Seen on YouTube (video uploaded on February 9, 2012). 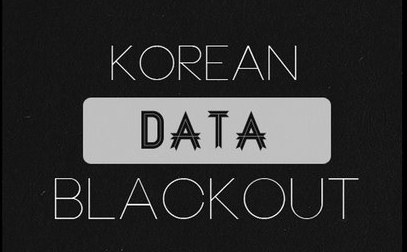 “[Korea Data Blackout] is a movement of support for administrators of Korean fansites as well as fans all around the world who work very hard …to provide pictures and videos of Korean artists. It is also a movement to make international fans realize just how much these people provide to their fandom experience…and to help them understand how important it is to follow their rules.” – Korean Data Blackout website, September 2012. Screen capture: Korean Data Blackout logo from KPK’s Digital Documentation of the website. Credit: Kaetrena Davis Kendrick. Earlier this year KPK published an essay about American law-makers’ attempt to pass a bill that would hinder the free flow of information on the Internet. Described as a piece of legislation that would protect copyright on the World Wide Web – with particular regard to how those protections manifest outside the United States – the bill was deemed too far reaching in its scope, targeting websites who so much as linked to questionable information with severe penalties. Businesses like Google and Wikipedia staged “blackouts” (as well as other sites, including the international Kpop fansite Eat Your Kimchi), wherein access to all or parts of a website was temporarily shut down. This was done to show what would happen if the bill had passed: access to information would have been seriously compromised in ways that the creators of the bill could not have estimated. Internet users understood the shaky path of this legislation, and, although access to information is continuously challenged, they used their voices to make sure this way was blocked. 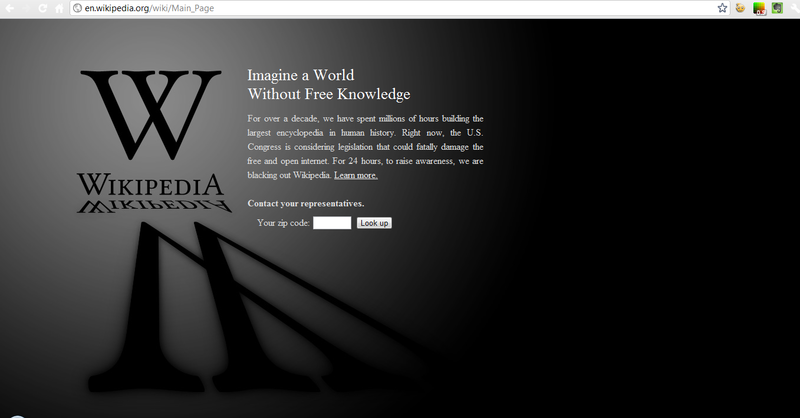 Wikipedia implementing a 24-hour Black Out to protest SOPA/PIPA (January 18, 2011). More recently, this same tactic – a blackout – was used by a Kpop fan community on Tumblr. This movement, called the Korean Data Blackout, lasted for ten days during September 2012, and was created to support Kpop website owners who provide Kpop media (fantaken media) to international fans. Specifically, the movement hoped to help international Kpop fans understand the central role that these fans play in providing graphics and videos to the Kpop fan community at-large, and to help Kpop fans understand how important it is to these website owners that their rules be followed. You can view the Digitally Documented web site here. Kpop Fantaken Content Rule 1: Don’t Steal, Change, or Use My Stuff (If You Do, Please Give Me Credit)!!!! Beyond misrepresenting the context in which they’ve chosen to pursue their work (producing the work of their own volition, for their own pleasure, and presumably for the joy of sharing with the Kpop community) and misunderstanding the nature of information flows of various international communities, those who participated in the Korean Data Blackout or who add these statements to videos and photos miss the real issue, which has nothing to do with Kpop fandom rules, and everything to do with copyright. The main reason the Korean Data Blackout movement overstepped its mission is because there is already a system in place for those who want to retain certain rights over original items that they have created and published on the Internet: it’s called Creative Commons (CC). Reading this blog, you’ve seen our CC licenses at the end of our essays (there is one at the end of this piece). CC offers several kinds of copyright licenses that not only protect ownership of of creative work, but tell people who interact with and would like to use the content how they can use it. There are six levels of licensing, from Attribution (the most lax) to Attribution-NonCommercial-NoDerivs (most restrictive). Provided the original content is theirs (not a KBS program, or a YG DVD of a BigBang concert, or a footage of a K-drama), Kpop fan content creators who are concerned about carrying out Rule 1 should find that the most the most restrictive CC license fits most of their needs. 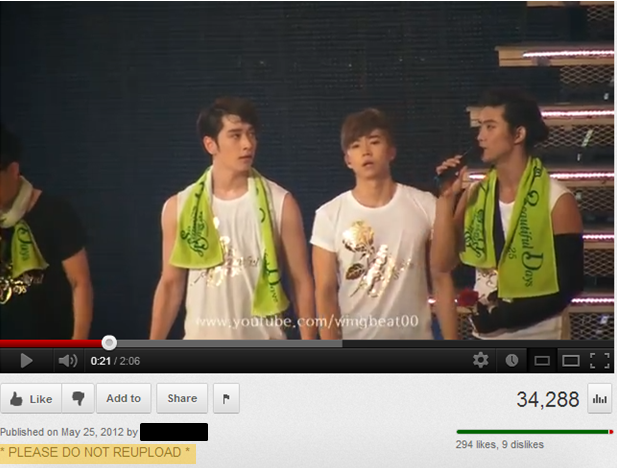 Screen capture: A fancam of 2PM in concert (original content created by a Kpop fan) with a “Do Not Reupload” request. Credit: Kaetrena Davis Kendrick. Therefore, Kpop fans who create their own content and would like other Kpop fans to adhere to Rule 1 should consider other alternatives to the popular video sharing website service in order to ensure they retain all rights – including distribution control – to their creative productions. The other concern with the Korean Data Blackout is the contingency of Kpop fans who believe that the content they do not own, but augment and distribute in the name of “spreading Kpop love,” also falls under the “fantaken” label, even though logically they realize that something is amiss (hence the imploring requests for mercy). Plenty of international Kpop fan content has been taken from other places like Korean media channels and re-purposed, usually to add translations in different languages, sometimes to distribute CD tracks, and other times just to offer a different portal to watch Korean television music programs and performances. In these cases, Kpop viewers are more likely to see comments from Rule 2. While there is a plethora of re-purposed Kpop content on the Internet, there are tell-tale signs that Korean entertainment and broadcasting companies continue to actively seek out and challenge channels or individual videos that reflect these kinds of productions. Additionally, Korean media and entertainment companies have created their own YouTube channels – partly a response to attempt to lower copyright infringement of their original programming and products. 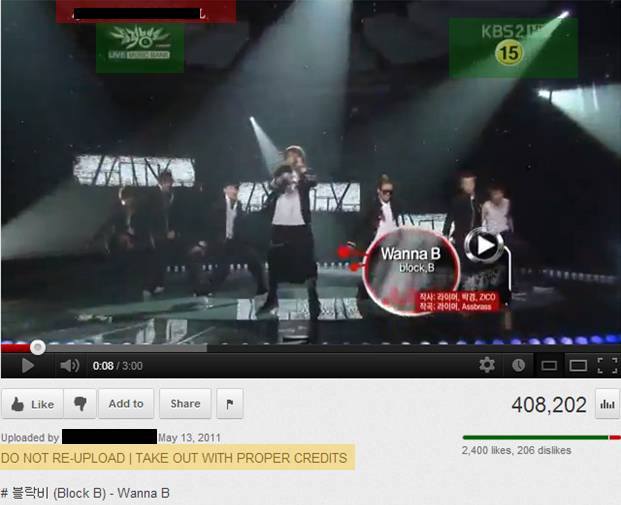 Screen capture: original content copyrighted to the KBS Music Bank television show (in green), but augmented with the logo of a Kpop fan YouTube video channel (in red) with a request to “give credit to” the Kpop fan YouTube channel (in yellow). Credit: Kaetrena Davis Kendrick. In addition to blatant copyright infringement, Rule 2 Kpop fans violate YouTube’s Terms of Service (6D), which states: “You further agree that Content you submit to the Service will not contain third party copyrighted material, or material that is subject to other third party proprietary rights, unless you have permission from the rightful owner of the material or you are otherwise legally entitled to post the material and to grant YouTube all of the license rights granted herein.” Other video sharing sites like Vimeo offer similar stipulations. 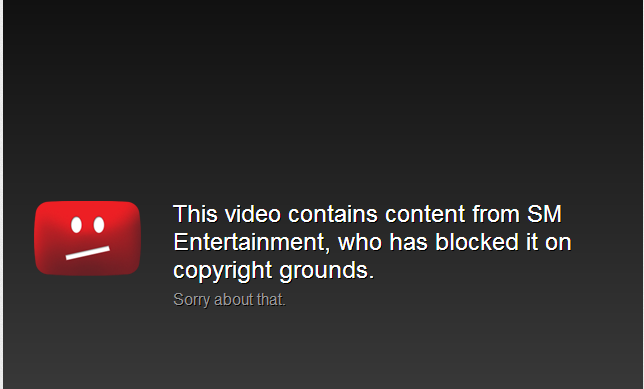 Screen capture: A copyright infringement claim on YouTube. Credit: Kaetrena Davis Kendrick. Unfortunately, Kpop fans who augment or enhance videos, television broadcasts, and other third party content with their own logos and language translations (or for the purpose of music distribution) and shore up these productions with Rule 2 statements are not protected in any way from claims of copyright infringement. There is no doubt that Kpop fans who share their fancams, offer up their multilingual skills, and keep other Kpop fans posted on the whereabouts of popular Korean music groups and artists are an important and vital part of the promotion and development of Hallyu as it moves outside of Asia and into the Middle East, Europe, and the United States. Unfortunately, the creators of the Korean Data Blackout Movement underestimated the depth and breadth of ways Kpop fans locate, access, and retrieve Kpop information and media. Furthermore, that underestimation was compounded by an attempt to create a context that conflated “rules of Kpop fandom” with the law of copyright. Considering the Kpop fans who make no exclusionary statements about their fancams (lam Cosmicaa) and legitimate businesses that offer Kpop fans ways to enjoy Korean Cultural Content (DramaFever, Viki), perhaps Kpop fans who are that concerned about getting credit for their work should use the protections that are available to them or come together en masse to create processes that benefit them and the Korean media companies with whom they are currently in conflict. In the end, the only true rule of Hallyu Fandom is this: Kpop is Love. While Kpop fans create and/or distribute content so that more people may enjoy it, truly loving something implies a willingness to protect it to some degree. In many cases, forgoing copyright can do real harm to the artists and companies who work very hard to entertain their fans. Instead of creating more barriers between international Kpop fans and the content they seek, those who create fantaken content should begin a meaningful dialogue in the community so that the real concern (“Let’s teach Kpop fans how to copyright their original work online” or “How do we get as much content as we can to as many people as we can when there are language, copyright, and media outlet barriers?” or “How can Kpop fans who create original content or augment other copyrighted content work within copyright law to expand distribution of Kpop content to an international audience?”) can be dealt with in a welcoming and solution-oriented, not punitive manner. What kind of impact do you think the Korean Data Blackout had on bringing awareness to the concerns surrounding fantaken content? What concerns do you have, if any, about the proliferation of questionable Kpop content online? Leave your comments below. Although I’m late coming to it, I enjoyed this article. I do, however, think there should be a much more expansive discourse on “rule vs. law” (closer to “faux-pas vs. law”) in the kpop fandoms at large, as it is indeed a prevalent problem – more so for some than others.This article zooms in on some good examples, but doesn’t cover it on the ‘daily basis’ scope as much as it does the application towards ‘singular instance’, and I think the former should also be addressed much more frequently and in more detail than it (still) currently is. When asking myself, “What kind of impact do you think the Korean Data Blackout had on bringing awareness to the concerns surrounding fantaken content? What concerns do you have, if any, about the proliferation of questionable Kpop content online?”, one glaringly obvious one that stands out to me is the power trips some fans (or even entire fandoms) are on despite their own ignorance. Discoursing what “copyright infringement” really means – and the vast nuances of it – is definitely something that is lacking in kpopland, and this is something that has a bit of a domino effect when being translated to its effect on fans in relation to copyright laws. Many kpop fans simply do not – for all they flout them inappropriately – understand copyright laws. More than half of the time, they don’t even understand how or why copyright infringement is not equivalent to plagiarism, or anything about Creative Commons licensing – nor do they seem to understand the nuances of Fair Use, or by what definition “creation” is held (legally speaking) when discussing “you own the rights to your work as soon as its created”. The differences between re-blogging, summary/citation, purpose/intent, translation, and linking – or even what “transitive” or “derivative” works ARE – seem to be utterly foreign concepts too often. They also don’t seem to understand that while many laws are universal, nuances do vary country to country – or that there is a very key difference in what a person owns and what they can prove they own in a court of law (in other words, actually registering a copyright) that often becomes the deciding point if and when legal action is *actually* taken. Even worse – they don’t understand the mechanics of filing such a charge, court costs, or that a court may or may not automatically side with them even when threatening such action (often for works they don’t actually own, no less). They don’t pay attention to what rights they may or may not be giving away (or assuming without merit) simply by choosing the venues they do, nor do many even bother to read the Terms of Service they’re agreeing to abide by when making accounts on them. Also, the variances of Media in copyright don’t seem to be understood, either (video, audio, photo, merchandise types, branding, etc) – and a disturbing lack of knowledge about commercial vs. non-commercial work and how copyright applies to each is present (people assume “I’m not making money, so it’s fine” is true). In as far as how to get a message across in situations involving the “Blackouts” (ie: making a statement), this ignorance is severely damaging. Fans need to truly understand – not just THAT certain ‘rights’ they have are at risk in these cases – but HOW, and WHY… as well as how these laws, if enacted, could affect major online resources (down to Wikipedia, Google, Youtube, etc). This often damages the messages they send because this ignorance spawns the notion that such laws would not affect them at all because they “own their work” – or the opposite: that such laws would prevent them from experiencing fandom in ways that wouldn’t be affected by them (ie: exaggerating the result if a law were passed, or extending it to areas it wouldn’t go due to misunderstanding the nuances of it. For example, a portion of SOPA that – if revived/pushed through – would have affected *streaming* resources was perpetuated through fandoms as potentially cutting off their access to fanfiction, photos, and print-translations in the last year. On top of this, fans didn’t even understand the severity of a FELONY comparative to a misdemeanor – or that this could potentially extend even to the covers performed of songs they assume are “their own”). Socialist and activist efforts pale in comparison to what they could be as a result – fans either don’t care enough or don’t understand enough to really get a valid point across. However, there are also concerns about the daily ongoings of media outlets and fans in general that these same things present problems for. There are constant and ever-present “wars” about assumed infringement (or so-called ‘plagiarism’) – power plays, arrogance, and oppression (emotional, mental, and of information flow) that really don’t do any favours for the Hallyu Wave.. and too many fans don’t seem to get how or why that is, either. Overall… I think this is a very large and very complex issue that deserves far more attention than it ever gets. Hello, thanks for this great response! One of the ongoing concerns of KPK members is helping Kpop fans understand the nature of ownership of content and ideas, and how important this is to the continuing success of Hallyu, which for many fans, only lives on the Internet and in social media. These tools and how they work, combined with the social organization of fandom (in which “Who has the information” is a certain driving force of behavior),consistently blur the lines between AND highlight the conflicts between regular benign participatory maneuvers and illegal behaviors (which are incorrectly perceived as benign). Your comments regarding nuances of plagiarism, etc. AND the concerns about and information flows lead me to send you to other KPK items you may find of interest: Our KPOPCON2013 presentation: http://bit.ly/1cbqiYd, which in part discusses similar issues in this post, and another KPK essay: http://bit.ly/1i1xEQB, which discusses information evaluation and censorship in Kpop online communities. I completely agree with your observations – I’ve seen this through the years, as well. My personal opinion – I definitely agree that “Who has the information” is a driving force of behaviour (as it is often anywhere, really, even outside of mediascape lol). Occasionally that’s positive, too, but it can get quite negative… it’d be helpful if information were more accurate and less flushed through with bias and hidden agenda in general – an issue I’ve seen more of lately (not in this article). I would also say that behaviours more often lean towards illegal, though can also be beneficial to the mobilization of Hallyu even being so… but a bit of a lack of true action from companies who realize the promotional value of such things has led to many fans’ arrogance (in assuming that other entities ‘can’t touch them’, rather than what’s more often the case – they simply aren’t). A more specific example that comes to mind is the understanding some have of fancams. Whether they’re good promotion or not is obvious, but many fans go ‘above and beyond’ to complain en masse when theirs are taken down, as if no one else – even a company – has a right to them. The opinion there is – the fan filmed it, so it’s “theirs”, and the company shouldn’t touch it because it’d be damaging the ability to promote for the artist. This isn’t inherently wrong on EVERY level (it does help promote lol).. yet, fancams are often banned in venues to begin with – and would also often be considered “derivative” works in that the fan themselves did not set the stage, the lighting, the sound, the costuming, or the performance. Even the angles they can obtain are limited to someone else’s creation (and seating arrangement). The right to produce derivative works, though… unless given by CC specifications.. remains solely with the original owner/creator. Or translated clips, as well – although the ‘purpose’ is nuanced and they’re essentially being used educationally, they’re still direct copies of another’s content, I would assume transitive – but far too extensive to even rely on that in Fair Use b/c too much footage is used – and even translation itself can get sketchy in legal terms. Fans, however, don’t seem to understand such things and instead lash out at management companies for ‘interfering with the promotional value’ if and when they choose to take action (though they don’t always). Ironically in some cases, it isn’t even the management company who has taken them down, but rather the distribution or production company instead – yet the ‘main company’ still gets blamed, and fans don’t understand how or why these other entities have the rights to it. Here, it is obvious that obtaining and spreading information is the driving force of action – but that the perception of a fan leans to (possibly inadvertent, or desiring of prestige) selfish intent and blatant disregard for the rights of the artists, their companies, and those they do business with. Sometimes the latter entities don’t mind, sometimes they don’t *find* every bit of it, and sometimes they do. I should note, though, that I meant overall with my previous comment that I wish this were an issue more commonly highlighted and detailed in ‘fandom circles’. Bluntly, I’m extremely disappointed with the way some fandoms (but not all) have ‘evolved’ through the years. I’ve noticed a steady decline in true knowledge, understanding – and certainly in ethical behaviour – both in fans and in media outlets. I do wish that more fans would take things such as this more seriously. They don’t more often than not, and it’s quite disheartening to see. I feel that discussions such as this are good, innovative tools – but the ‘average fan’ (sadly) doesn’t give such information or even studies of kpop culture as much attention as both deserve. Although I’ve seen some groups that do touch on such things (legalities, nuances, ethics), it’s often twisted to their own agenda and not entirely accurate (not KPK, I mean specific fandom sites/groups). Even some reputable media outlets still have selfishly-aimed writers who care more for their own ego and status than they seem to for Hallyu. Ah, I also meant to include (briefly – sorry my comments are so long!) – that another aspect that worries me in general is that some take “the rules of kpopland etiquette” entirely too far and instead *damage* a thing’s ability to help artists. Some fan-sites claim others “can’t” share information they provide (even though others do clearly have the right to link to it, summarize it, or cite it) simply because they say so, out of spite. Perhaps this is another area to study/present – though this is mostly a byproduct of “fanwars”. Wow, what a misleading article. The “Standard Youtube License” ONLY gives Youtube the license to reproduce, distribute, prepare derivative works, not just any visitor of YouTube! There is still another license that a video uploader can choose if they want to make the video free to edit and reproduce. You probably need to double check before you post something. 🙂 Anyway, bye! Hi GDOOR, thanks for your comment. The point of this article is to highlight mistreatment of copyright law with regard to fan-driven/created content in Kpop-fandoms. This article was written several years ago (2012) so it’s possible that YT has updated its license permissions. However, your statement doesn’t erase the fact that using content that is not your own without explicit permission from the original creator is a violation of copyright. Fans who create videos using their own content – are, of course, free to say that others may reuse their stuff – however, if their videos include content gathered from shows that they didn’t get permission to use – it is a violation of copyright. In other words, a fan who uses a company’s content without that company’s permission and then says “hey, use ‘my’ video like you want to” is violating copyright for the original offense (not asking for permission) AND distribution (telling others they can use it, too). It is completely possible that some companies choose the license that you are referring to when they upload their content; and in that case, of course the copyright issue would be moot for that specific content from that company. At the time this article was written, however, that was not standard practice.